For Helloween, 7 Sinners is to Unarmed as Rabbit Don’t Come Easy was to The Dark Ride. The band, unsatisfied with the end result of the straight-faced The Dark Ride, made up for their alleged mistake with their next album, Rabbit Don’t Come Easy, their most lighthearted release since Andi Deris first joined as frontman. Fastforward to the present, and it’s easy to make the accusation that they did the same thing in reverse with 7 Sinners after receiving overwhelming critical backlash for releasing Unarmed, a 25th anniversary album made up of re-recordings of choice Helloween songs. While that album was a disgrace to the band with its ridiculously poppy renditions of some of the German veterans’ best songs, 7 Sinners is on the opposite end of the spectrum in nearly every way. It’s easily Helloween’s heaviest album to date and, thankfully, it’s a good one. In fact, I’d say that it’s good enough to make one forget that Unarmed ever even existed. 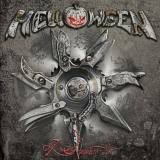 Helloween is a band that refuses to make the same album twice, and this tradition by no means ends with 7 Sinners. As stated previously, it’s a surprisingly heavy record, one that’s chock full o’ riffs reminiscent of those on Judas Priest’s classic Painkiller - yet it still sounds like Helloween. Deris’ raw, sleazy voice hasn’t changed one iota, and the band is still more than capable of churning out incredible melodies. 7 Sinners, though it may not seem like it at first, is an impressively layered album, seamlessly incorporating tasteful keyboard work and well-done vocal harmonies among the chugging (and sometimes technical) riffs to create a mix that is densely packed, and one that takes multiple listens to decipher. This makes for some big, epic moments, especially in the more spectacular choruses (See Who is Mr. Madman? and The Sage, The Fool, The Sinner). Helloween even shows a surprising adeptness at keeping up-to-date with the current metal scene, with lead guitar lines and keyboard trickery that emulates modern power metal to a degree. 7 Sinners is hardly original (the only stab at originality here is flute solo in Raise the Noise, which feels a bit tacked on, as pleasing as it is), but it works surprisingly well and succeeds in nearly every aspect. 7 Sinners is not a perfect album, however. Every song (except for the interlude Not Yet Today and the closing song Far in the Future) follows a linear structure of intro-verse-chorus-verse-chorus-solo-chorus, and at times it feels like Helloween relies too much on heavy riffs and not enough on memorable hooks. Furthermore, it is downright odd how straightforward of an album 7 Sinners is; while most modern Helloween records feature diverse song styles, this album rarely strays from its strict formula of heavy power metal. The band seems primed to pull off a Maiden-style epic when The Smile of the Sun starts to play, but it quickly deteriorates into a silly and formulaic track; Deris’ voice in the chorus had me laughing because his singing style doesn’t fit the song at all. And who in the hell thought The Smile of the Sun and You Stupid Mankind were good song titles, anyway? Even with these few small flaws, 7 Sinners is still a very good album. Its production is superb, its melodies at times breathtaking, and its heaviness underscored with a dose of lighthearted attitude. For some, its lack of diverse songwriting may actually enhance the album, as it does give 7 Sinners a sense of direction that hasn’t been seen on a Helloween album since Deris’ early days in the band. An album that should belong in any fan of power metal (or even good ol’ heavy metal) fan’s collection, 7 Sinners is an album that demands to played LOUD, and played often.